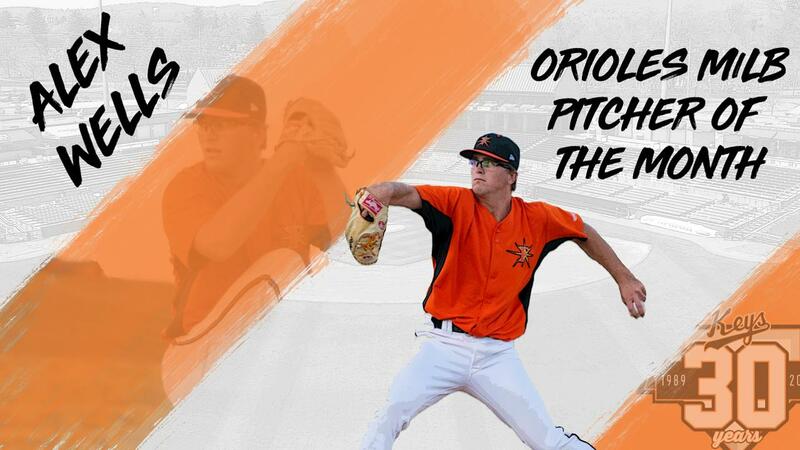 FREDERICK, MD-On Tuesday, the Baltimore Orioles announced that Alex Wells was named the Orioles Minor League Pitcher of the Month for August. He becomes the third Keys player to receive a monthly organizational honor, joining Ryan McKenna and Zac Lowther who were the player of the month and pitcher of the month for June. Wells, 21, went 3-1 with a 1.97 ERA in five August starts (the lowest figure among any Keys starter). Over 32 innings he allowed only eight runs (seven earned) on 22 hits to go with four walks and 29 strikeouts. Opponents batted just .188 against him, while four of the five starts were quality outings. A midseason Carolina League All-Star, Wells went 7-8 with a 3.47 ERA in 24 starts for the Keys. Working 135 innings, he allowed 56 runs (52 earned) on 142 hits to go with 33 walks and 101 strikeouts. Opponents batted .270 against him. Across the Carolina League, Wells placed fourth in ERA and among starting pitchers ranked fourth in lowest BB/9 IP ratio (2.20) and fifth in fewest baserunners/9IP ratio. He tallied a 3.36 ERA after the all-star break. One 2018 highlight for Wells was pitching in the Sirius/XM Futures Game at Nationals Park. An Australia native, the left-hander represented the World Team and retired both batters he faced on only nine pitches. Rated as the No. 13 prospect in the Orioles system according to Baseball America and the No. 26 prospect according to MLB Pipeline, Wells was signed by Baltimore as an 18-year-old out of Austrailia in 2015. He has an identical twin, Lachlan, who is pitcher for the Minnesota Twins organization.